When it comes to plat books, and all types of printed maps, there are limitations to how geographical data can be presented and what can be shown. Most, if not all, of the limitations revolve around paper size. Typically, the more paper you have, the more data you can fit. Burritt Township has 881 parcels within its 36 sections alone. That’s a lot of data and landowners to map! Plat books tend to focus on larger landownership due to the difficulty of being able to read small parcel names on a map. When creating a plat map, the landowner names need to be large enough to be legible; otherwise the map is of no value. Add in other important features like parcel boundaries, acreage, roadways, waterways, etc., and your map begins to fill up very fast. Congestion can and always will be the primary issue with plat maps. 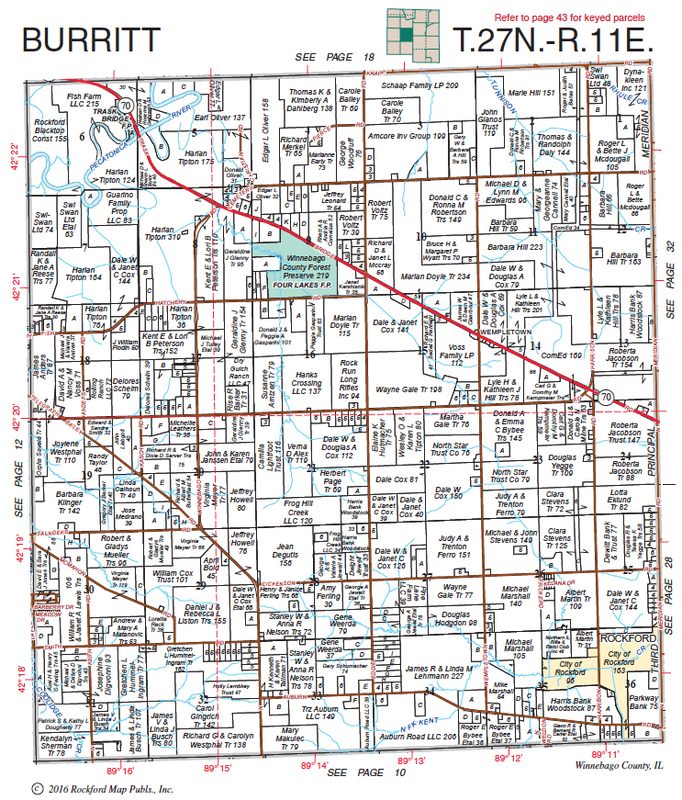 In order to maintain a practical balance, each township map within our plat book is printed on an 8.5” x 11” sheet. The 8.5” x 11” print size helps to manage production expenses and creates a map book that is functional and mobile. Thanks to our innovative labeling procedures, we are able to include extensive ownership information on the maps. For parcels of 30 acres or greater, we display the full owner names. For parcels between 7 to 29 acres, we are able to display full owner names by including an Index to Owners in the back of the book with keyed notations on the map. Rockford Map Publishers is always thinking of better ways to display landowner names, but at some point, there is only so much you can display on a map. We believe our standard plat map scale makes the most practical sense when dealing with the limitations that paper imposes. 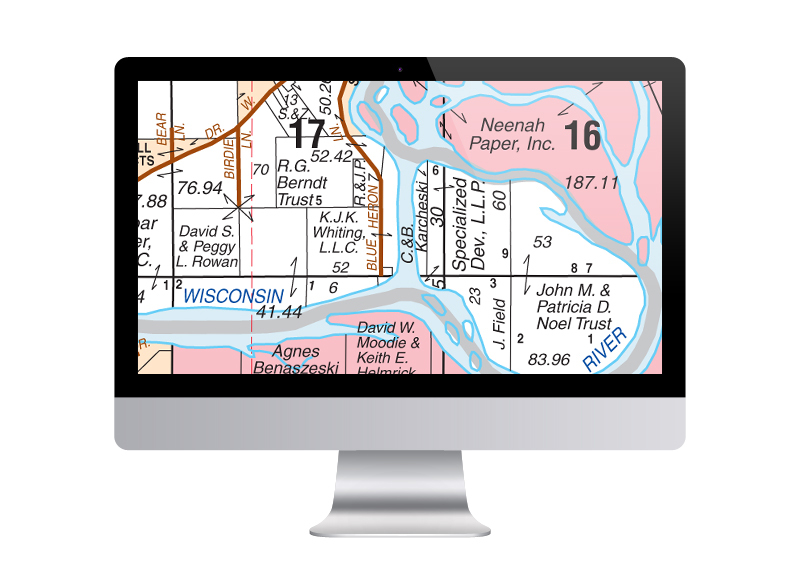 The main way to combat the difficulties of landownership mapping is to create a digital map. With an eBook, or any of our other digital map products, you can magnify and enlarge the owner information as large as you would like. Our eBooks contain the same content as the plat books, but remove the limitations that paper imposes. Not only can you enlarge these digital maps, but you can create and easily manage markups and comments. The difficulties of landownership mapping come from trying to pack a wealth of information into a finite area. The most logical future of landownership mapping is digital, because the limitations are seemingly endless with what can be shown. Our plat books are great for providing an overview of landownership, but considering all of the additional features an eBook provides, it’s easy to see the extra value the eBook provides as a landownership reference tool. Where do you think landownership mapping will be in the future? With both technology and landownership having a dynamic, ever-changing quality… it’s hard to say. The one thing we do know is that Rockford Map Publishers will continually be at the forefront of landownership mapping!